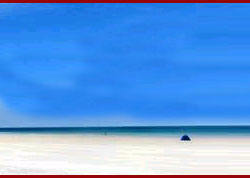 The place India Travel Destinations takes you on travel to the most romantic city Agra in Uttar Pradesh, India. Agra is the most important center of tourism in Uttar Pradesh, India and is famous all over the world for the lovely Taj Mahal, a memorial that was constructed by the Mughal Emperor Shah Jahan. Agra city is the one of the famous destinations of the World Tourism with three tradition monuments -The Taj Mahal, Fatehpur Sikri & Red Fort. Agra is an energetic centre of Culture, Art and Religious philosophies that have enriched mankind and shaped human thought over centuries. Agra is famous for handicrafts products such as engrave work on Marvel, Leather work, Footwear, Brasswear, Carpets, Jwellery, Zari and Embroidery work. We provide information on tourist destinations in Agra Travel including the beautiful Taj Mahal. Agra tour is one of the most popular travel places amongst tourists. 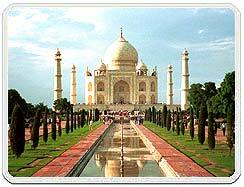 Agra Tourism has many other tourist places to provide for the tourists visiting Agra (India). A tour to Agra is lifetime knowledge to remember forever as the tourist destinations within and around the city go away the travelers captivated. Whether the red sandstone city Fatehpur Sikri, the fortified fortifications of the Agra Fort, the temples of Vrindavan that make you remember the childhood tales of Lord Krishna or the Akbar's tomb at Sikandra; all these travel destinations in Agra provide you plentiful opportunities to discover the monarchs and architecture of Mughal time. There are very few cities in the world that can equivalent the history and heritage of Agra - the city of Taj Mahal, situated at a distance of 204 km south of Delhi. 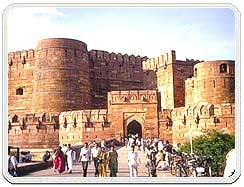 Agra is the single most famous tourist destination of Uttar Pradesh India. 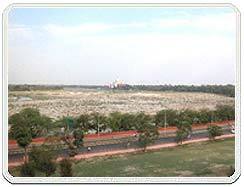 This famous city situated on the west bank of River Yamuna. Some other famous places are situated nearby Agra like Agra Fort, Chini Ka Rauza, Rambagh, Jama Masjid, Jahangir Mahal, Chisti's Tomb and Itmad-ud-Daulah's Tomb. Agra is also famous for the Agra Fort, which is an absolute treasure trove of the Mughal architectural tradition. The different buildings within this extensive fort complex represent the adjustment of different cultures, which was the mark of the Mughal period. Jama Masjid of Agra was built by Shah Jahan in 1648. An inscription over the main gate indicates that it was built in the name of Jahanara, Shah Jahan's daughter, who was finally jailed with Shah Jahan by Aurangzeb. Chini Ka Rauza is the only building in India to be adorned exclusively with glazed tile work. The small mausoleum overlooking the River Yamuna was the tomb of Afzal Khan, a minister in the court of Shah Jahan. Rambagh is also known as Araambagh in the past time. Rambagh is the probably amongst one of the first Mughal monuments of India. It was built by Emperor Babar in 1526. Jahangir Mahal is biggest private residence of Emperor Jahangir, situated in Agra city. 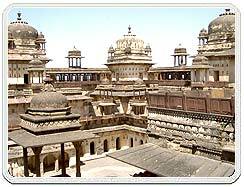 Jahangir Mahal is an excellent combination of Hindu and Mughal architecture. The palace has a hall which is called Jodhabai's dressing Room. Jodhabai was Jahangir's Hindu mother. Later the dressing Room of Jodhabai was used by Jahangir's queen Noorjahan, the Light of the World. Chistis Tomb is same as the Mecca Mosque. Chistis Tomb is situated nearby the small white marble tomb of Sheikh Salim Chisti. Air : Agra is easily accessible from all the parts of India by air.